You would expect the catalogue to be oozing with marvellous recordings of this core repertoire of Baroque genius, but so many versions come and go that it�s sometimes a matter of luck as to what you will find in the shops. I was weaned on the Herbert von Karajan DG recordings, and after such a heavy diet it was always going to be something of a relief when the first decent �authentic� versions appeared. Trevor Pinnock�s 1982 Archiv set has an all-star cast, but is getting a little long in the tooth after 25 years or so and always was an uneven project, with some balance problems in the recording and struggling horns in the then revolutionary super-fast tempi. I�ve lived quite happily with the Taverner Players under Andrew Parrott on EMI Reflexe for what now also seems far too long, so I was glad of the opportunity to hear what today�s musicians make of Bach�s own instrumental pride and joy. For a start this is a very well recorded production. The acoustic is warm but not overly resonant which, given the material at hand is just as well � this is playing whose white-hot crispness needs all the detail it can get. The horns are the stars in the Brandenburg Concerto No. 1 in F major, with plenty of the echo effects and gorgeously handmade notes being pinched out of the natural instruments. The tempo in the opening movement is brisk but unforced, allowing the parts to flourish but without sluggish stagnation. There is a little tempo inflection at the recapitulation which Andr�s Gabetta likes doing, dipping slightly and allowing the music to �take off� anew rather than just plunging on at the same pace. It�s a tiny point, but well made. I�m not sure how Bach would have felt about another interesting moment, which is the way the oboes imitate the throbbing strings near the beginning of the Adagio. There are one or two understandable stability problems for horn 1 in the very high reaches in the final Menuet, but in general this is a satisfying and successful opening. Brandenburg Concerto No. 2, also in F major is the one with solo trumpet, recorder, oboe and violin as soloists. Again, the opening tempo is well judged, being excitingly fast without tumbling over itself or becoming too hectic and busy. The soloists are all very good, though I�m not so keen on the recorder player Luis Beduschi�s forcing of the notes in the Andante and elsewhere. Trumpet player Niklas Eklund deserves a mention, not only for his spectacular solos, but for his chamber-music sensitivity when playing accompanying lines. There is some balance shifting between pieces, with the harpsichord being brought forward for the Trio Sonata from the Musical Offering. This is understandable, but becomes a little jangly and distracting in this last piece � being in the foreground rather than mixing with the other instruments. Musicologists can argue about some of the trills, which sometimes seem a little slow and grandstanding, especially in the flute. I would also argue that fillers should be just that, fillers at the end rather than intermezzi � especially with the balance adjustment, but seeing as Bach would never have expected all six concertos to be played back to back there�s no winning the argument one way or another. 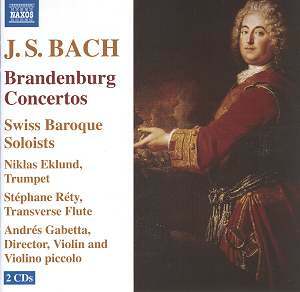 Brandenburg Concerto No. 4 in G major plays a solo violin against a recorder duet. Andr�s Gabetta�s solo playing is suitably dazzling, and the recorders still come over as reasonably well matched despite the less strident playing of Vivian Berg on the 2nd part. It�s a shame about the slightly sagging intonation and lack of ensemble on that Phrygian cadence at the end of the Andante, but the final fugal Presto has an irresistible elegance and bounce which I enjoyed greatly. The harpsichord is once again dragged forward for solo glory in the Brandenburg Concerto No. 5 in D major, but not as far as for the Trio Sonata, making a fine balance between strings and soloist violin and flute. The historical significance of the harpsichord part: deliberately written out rather than left as a figured bass as a basis for judicious improvisation � is pointed out in the usefully comprehensive booklet notes by Keith Anderson. There�s a bum note from the flute at 2:54 in the otherwise nicely turned Affetuoso and one or two intonation �moments� here and there but I don�t mean to be picky, this concerto has an infectious drive and generally superb playing which carries the extra weight of its extended thematic development well. The mixed bag of strings with which the Brandenburg Concerto No. 6 in B flat major sets out is light-footed and well controlled. The opening movement is difficult to bring off well, but the recording spreads the instruments nicely so that there is good definition between the parts. Each part is taken by one player, but even though there is only the harpsichord to fill out what is only a string sextet, there is plenty of richness to the sound. It is of course a nightmare keeping each part pinpoint accurate in terms of intonation all of the time, but even with some nimble playing demanded of the bass part the player succeeds well enough. The Concerto in G minor, BWV 1056 was (possibly) originally for harpsichord and strings, and has been arranged here for flute, strings and continuo, meaning that the harpsichord is still around, but has been relegated to filling out the texture. The opening Allegro seems quite stately in comparison to many of the Brandenburgs, but the flute playing of St�phane R�ty, who also created the arrangement, carries the important melody lines well and the pace and balance always feels natural. Bach�s music is such that this kind of arrangement is relatively straightforward, the message and content of the music having enough strength of character to be performable on virtually any instrument with the virtuosic characteristics required from the passagework. BWV 1056 has already appeared as a violin or an oboe concerto, and this arrangement is a useful addition to the flute repertoire. This is a cracking production with very much going for it. Anyone lacking this essential repertoire in their collection should purchase post-haste, and need probably look no further. Those of us with cherished favourites can explore further without breaking the bank, and while this issue may not entirely replace established catalogue evergreens it can certainly tick as many boxes as most people will require.